Leersia virginica, commonly called whitegrass or white cutgrass, is a woodland grass native to Eastern North America. Leersia virginica, called whitegrass or white cutgrass, is a relatively inconspicuous grass that is often overlooked. It is native to a wide range in Eastern North America, and likes relatively wet habitats in woodlands. Here you will learn how to identify this plant, learn a bit about its ecology, including its habitat and preferred growing conditions, and what it supports in the food web. I also explain how you can use this grass in your garden or landscapes. Whitegrass is rather nondescript and can be tricky to identify visually. The stems of this grass tend not to support their own weight. They grow upright if supported by other vegetation, otherwise they sprawl, and if they reach the ground, they often root at a node. The edges of the blades are noticeably rough-textured. The flower and seed is on a stalk which typically has about 3 or so side branches, which often sit at right angles to the main stalk. The panicle tends to measure 5-20cm and each spikelet 2.9-3.9mm long. The seed is thin, and on a very thin stalk, which can be hard to see unless you look closely. Prefers part shade, ample moisture, and soil rich in organic matter. Whitegrass occurs naturally in moist areas in deciduous woods, especially around slight openings, like the edges of paths, or along streams or seeps. It sometimes grows in wetlands or swamps. It grows best in fertile loamy soil, rich in organic material. Aesthetically, whitegrass is one of those plants that is easily ignored, but it does have a neat, attractive look that can add a subtle lushness or accent to more wild or natural-looking landscapes. Growing this species in your garden, especially if your property borders woods or wild areas, can help provide a seed source for this native grass, which can help it out-compete invasives such as Japanese stilt grass. White grass makes an excellent replacement for stilt grass--it often grows well in similar conditions, but it has stronger roots which will hold the soil better. Whitegrass is not suitable as a lawn grass. Its more sparse growth and love of wet, shady areas makes it adapted to very different conditions. However, it can be grown interspersed with other shade-tolerant ground covers, underneath trees, especially in low-lying areas, along seeps or drainage ditches. It can also be grown on its own in moist, shady areas. The sparse growth typically does not require any mowing or clipping, making it a low-maintenance plant. The larvae of the northern pearly-eye butterfly, Enodia anthedon, can eat this grass, among several other native grass species. White Grass (Leersia virginica) - On the Illinois Wildflowers website. A heavy-duty botany book, if you want to become an expert on North American grasses. Not a field guide or handbook! Nimblewill, a grass native to North America; uses for this grass in lawns and advantages to using this grass over other grasses. 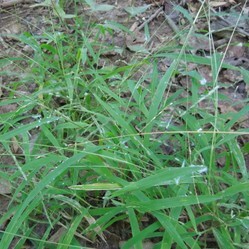 Japanese Stiltgrass is an invasive species of grass that has become widespread across Eastern North America, especially in the southeast. Learn to identify and control this weed. Yeah! I actually tended to ignore grasses, for years...but they're an incredibly huge part of ecosystems and plant biodiversity. Even in forests, which we don't think of as prime grass habitat, there are tons of grasses, both native and invasive. Lately I've undertaken the project of identifying as many plants that grow wild in my region as possible, and I've started writing some articles about grasses, in part to raise awareness of them. It makes a difference too, when you change which grasses grow in an area. I've been using several grasses to replace the invasive Japanese stiltgrass and it's so exciting to see a lot more insect biodiversity appearing, and I'm also starting to see some changes in the soil, as the deeper-rooted grasses are better at holding the soil. We tend to forget about grasses when we think of native plants and weeds. White snakeroot, Ageratina altissima, is a wildflower native to Eastern North America; here learn how to identify it, how to grow it, and how it supports the local ecosystems.